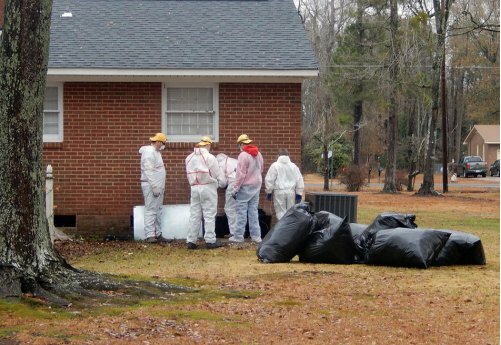 Members of Troop 33 prepare to enter a crawl space beneath a house in Lumberton, North Carolina, to remove insulation and ductwork infected by floodwaters following Hurricane Matthew. Pictured (from left) are Nathan Overmann, Caeden Keith, Brandon Radtke, Jack Petrie and Austin Petrie. Not pictured is Cliff Golden. 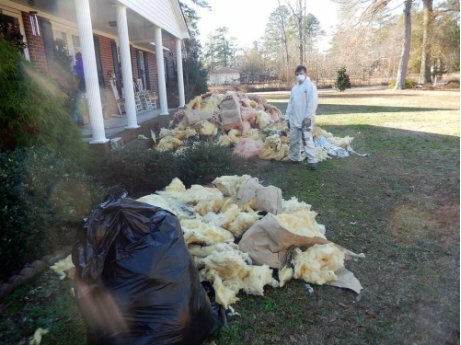 Austin Petrie stands next to a pile of insulation removed from the crawl space of a house in Lumberton, North Carolina. Troop 33 Scouts removed insulation and ductwork infected by floodwaters following Hurricane Matthew. The insulation in this photo was removed through a small vent window barely visible to the left of the mound. DeKalb’s Boy Scout Troop 33 dedicated the holiday school break to helping victims of Hurricane Matthew. The storm killed 49 people in the United States. Hardest hit was North Carolina where 28 lives were lost. On the day after Christmas a work crew of Scouts began a memorable trip to North Carolina. Damage was widespread. Areas hit by storm floodwaters required a teardown to remove any damaged materials, including crawl spaces under homes. Scouts were assigned to work at three different home sites. Scouts gutted crawl spaces at the first two houses. For protection they wore Tyvek suits, N95 respirators, gloves and safety glasses, with headlamps to light their way in the darkness. Working while lying flat on dirt or sand, they removed ducts and insulation infected with mold and mildew, which would often leak trapped floodwater. Insulation and ductwork was handed from boy to boy to move it across the crawl space for removal through tiny vent openings along the concrete walls. Giant mounds of insulation accumulated outdoors near these tiny vents. Besides being a dark and dirty job, some exciting moments came along with spiders and even a den of snakes. About eight snakes were clustered together in a hole beneath one of the houses. Since the boys didn’t bother the snakes, the snakes didn’t bother the boys. The third project involved emptying a house of all its contents prior to demolition. The house was still filled with furniture. Scouts accompanied the family as they went through the house deciding which items could be saved. All saved items were marked and gathered together in the front lawn, while other items were placed alongside the road for disposal. Before each project Scouts met and talked with victims. The people seemed strong and positive, resonating courage and hope. Scouts signed their names inside Bibles that were gifted to the three families they helped. It was a meaningful exchange. Troop 33 stayed at the Hyde Park Baptist Church in Lumberton, North Carolina. They slept in a gymnasium, were provided meals, plus had access to hot showers in a special trailer parked nearby. The disaster organization, NC Baptist Men, assigned projects for the Scouts to carry out. Other volunteers stayed in the gymnasium as well. Free time after dinner was often spent with games or playing basketball. Scouts met and came to know several great people during their stay. Returning to DeKalb they drove through the Great Smokey Mountains near Gatlinburg, Tennessee, site of a giant wildfire a month earlier. Scouts were scheduled to help sort donations at a distribution center in Sevierville, Tennessee, but the project had been cancelled by distribution staff a few days earlier. Scouts enjoyed New Year’s Eve with a nice restaurant dinner followed by watching New Year’s festivities on television. During the final drive home on New Year's Day they celebrated 2017 with a pizza party. Boy Scout Troop 33 is sponsored by First Lutheran Church in DeKalb. Visit them online at www.troop33dekalb.net.